When it comes to America’s favorite Thanksgiving leftover, there can’t be too much controversy. Most people are bound to gravitate toward the holiday-specific side dish of stuffing. My family use to slice it and fry it on that Friday morning for my favorite breakfast of the year, plus it’s great in sandwiches. Frankly, I’d be shocked by someone who didn’t pick stuffing as their favorite leftover. Which makes the results of The Honey Baked Ham Company’s poll of America’s favorite Thanksgiving leftovers not that surprising. According to a promotional email we received today, “To celebrate the launch of their new heat-and-serve side dishes, The Honey Baked Ham Company conducted a nationwide survey to determine each state’s favorite Thanksgiving leftover side dish.” The company states that the survey was done on its behalf by MMR Research, polling 5,106 Americans representative of age and gender in all states and the District Of Columbia. Any ham-related dish, however, is nowhere on this list. It’s all stuffing. Yes, only two states—Colorado and Washington—dared to offer “mashed potatoes” instead of stuffing as the state’s favorite Thanksgiving leftover side dish. 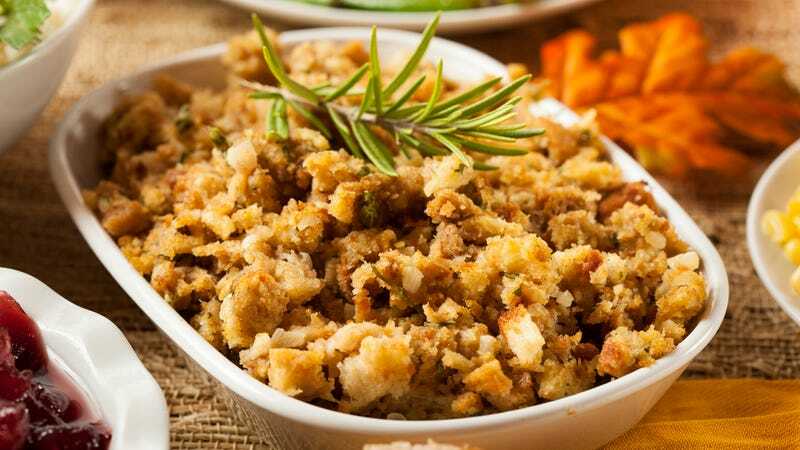 Overall, 31.1 percent of Americans chose stuffing, followed by mashed potatoes and sweet potato casserole. Green beans and mac and cheese trailed by about 8 percent, and maybe few people are huge fans of cranberry sauce, seeing as it was only the top choice for 4.5 percent. Those still perplexed as to why The Honey Baked Ham Company would undergo this survey in the first place only have to look at the company’s new line of side dishes. The lineup does include cornbread stuffing, as things turn out, as well as smashed potatoes and macaroni-and-cheese. So it seems like America will be on board with these ready-mades, even if they fail to embrace the ham. What’s the most-Googled Thanksgiving recipe in your state?